Growing up, I had a very active imagination. I loved the Lisa Frank stickers with unicorns, Pegasus, and dragons. So, it isn’t a surprise that fantasy and science fiction have become one of my favorite genres. I think I was introduced to fantasy with CS Lewis’ classic Chronicles of Narnia. I loved Aslan and how the children interacted with him. Besides Aslan and Lucy, my favorite character was Jewel the unicorn from the final book. I loved how he fought for and related with the king. Another favorite from growing up was Norton Juster’s The Phantom Tollbooth. My sixth grade teacher read it to us. My imagination was captured with Milo’s adventure through the tollbooth. He must bring Rhyme and Reason back to the realm. He has to get the two brothers (leaders of Dictionopolis and Digitopolis) to agree. Through it all he has the Watchdog to help him stay on task and not waste time. The fun part was finding a web-site that told the story behind the story. As I had kids, I looked for fantasy and science fiction books that I could share with them. Timothy Zahn’s Dragonback series was one of those fun finds. I read the story of Jack and was immediately hooked from the first chapter with the shipwreck. It was fun to read it with my husband and then to see my kids read them. They loved it as well. The struggles of Jack to try to clear his name and move from thief to a poet warrior give hope to kids and make the reader cheer him on. It wasn’t always that I showed books to my kids. Sometimes, they found a book and said, “Mom, you have to read this!” One such book was “Mom, you have to listen to this!” They found Dragon Rider by Cornelia Funke in an audio book. We sat down in their room and listened as Brendan Fraser worked his magic with Cornilia Funke’s words. Sorrel the Brownie came to life as did Ben, Firedrake, Twigleg, and Nettlebrand. The characters still to this day have his voice when I read the book. The interactions of these characters with each other make the book work and make readers love it. When I teach students to write a children’s fantasy story in Spanish, I use excerpts from this book to show them character development. You can read an excerpt of Dragon Rider online. The last two years, I had the privilege of spending 50 minutes each day on a one way road trip to school with my now seventeen-year-old son. We found the best way to spend the time, and stay awake, was to listen to audio books. We found all kinds of books. Some that were okay, but not great, and others that made it to my top 10 plus three list of children’s books. One of these was Beyonders by Brandon Mull. The story weaves from the real world into a fantasy world. Jason reaches it by falling into the hippo’s mouth! Literally! From there, he finds himself an unexpected hero. He must fight against the emperor to try to put the Blind King back on the throne. Jason works with another girl from the real world who followed a butterfly into the magical realm. Jason has an opportunity to return home, and must decide if it is worth returning to finish the quest. They go through numerous adventures as they try to fulfill the quest. It is well written, page-turning (if you’re reading it, CD changing if your listening) and encourages the reader to follow after good. If I haven’t given you enough ideas for a book, then check out the other posts this week from Children’s Book Week. Whatever you do, find a book and curl up and read. Read to your kids, read to your family, read to yourself. Enjoy! 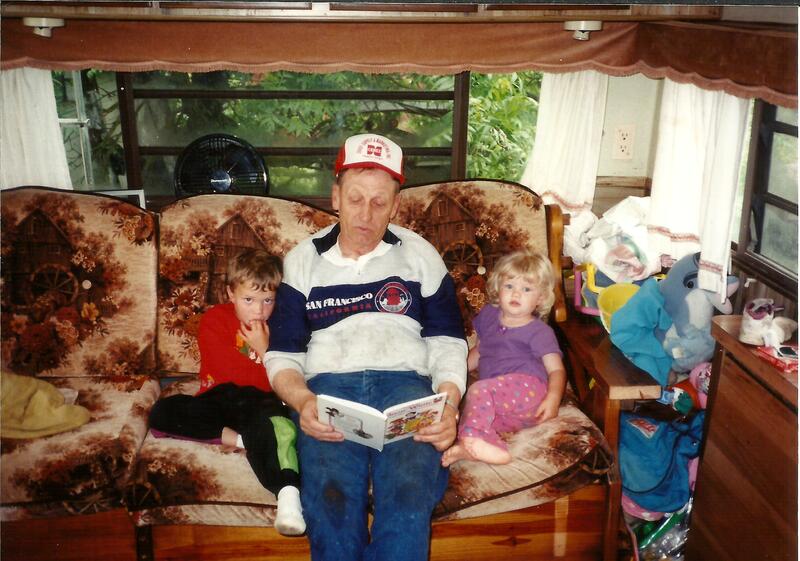 My kids enjoy a book read to them by their grandpa.